This post describes the four day festival of a southern state, Tamil Nadu, called Pongal. Purchase Pongal Greeting Cards! Send to your friends! Pongal is the first festival beginning off each new year in the Indian state of Tamil Nadu. As the dates for this festival are calculated by the solar calander (ie. Western), the dates of January 13-16 rarely change. Each day of this festival has a special significance, however, it is celebrated more grandly in the villages, while the city folk mainly celebrate on the second day only. The first day of the festival, which falls on the last day of the Tamil month, Margazhi, is called Bhogi. On Bhogi all people clean out their homes from top to bottom, and collect all unwanted goods. In the evening, people will light bonfires and burn what can be burnt. In the village where I celebrated Pongal, the people lived in mud huts with thatched roofs. The porches of these homes was fully covered by the thatch material, but somewhat elevated from the ground. This part of the home was taken apart and reconstructed on this day along with the front section of the walkway in front of their home (pictured to the left). Both the porch and ground in front of their home was solid mud which had dried. So, to undo this, they put in water to soften it, and dug it out and rebuilt it. After rebuilding it, they took cow dung and added water to make a paste and spread this mixture evenly over the new fixtures to coat and sanitize them. This mixture was also spread on the floor of the hut, on which we slept at night. As they don't have beds, we slept on the floor of the mud hut with a mat between our bodies and the floor. Although, the mixture had been spread on the floor, it did not have an unpleasant smell. In addition, the family I stayed with installed a new ceiling fan for Pongal. The second day of the festival which falls on the first month of the Tamil month Thai is called, Surya Pongal (or Thai Pongal), is the day on which the celebrations actually begins, is the first day of the Tamil month Thai. On this day, Surya, the sun God is worshipped and women will wake early on this day to create elaborate kolum on the grounds in front of their doorway or home. Kolums are created with colored rice flour placed on the ground carefully by using one's hand. The picture shown to the right shows the beginnings of this. The women in the picture took several hours to finish that kolum. All people will wear their new dresses and use the new utensils or household items which replace the ones discarded the previous day. On this day the new rice is collected and cooked in pots with milk until it overflows. It is this overflowing which means Pongal. 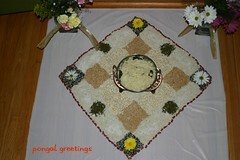 This overflowing of rice is a joyous occasion, and the children and adults as well will shout out 'Pongal-o Pongal!' Children will dance and make music to the tune of these words. As far as I know, the words have no real meaning but an expression of happiness that the new harvest is here and we should enjoy it! The rice is cooked and prepared as a dish called Pongal, which is rice with dhal and sugar. This Pongal variety is called venpongal, ven meaning white. Another variety is also prepared with dhal and jaggery (sweet), called chakraipongal, chakrai meaning sweet. To accompany the venpongal, people eat brinjal (eggplant) sambar (stew), vadai, idli, and spicy accompaniments. This is one of my favorite meals!! The third day is called Maatu Pongal, maatu meaning cattle. This day is devoted to paying homage to cattle. Cows and Bulls are decorated with paint and bells and people pray to them. In fact, in my Pongal experience, the cattle were decorated with bells on their neck, and kum kum placed on their head, and we (My friend, her family and I.) paid respect to them by bending down, like praying in temple, and touching their feet and foreheads, followed by an aarthi (showing fire to the object of praise) and offering the cattle prasadam (food offering, in this case, pongal). In some villages in south India, there are bull fights of varying types. These are not so common as they once were, I understand. The fourth day is termed as Kaanum Pongal. On this day, people travel to see other family members. As in the family I stayed, we traveled to another village to meet her family there. On this day, the younger members of the family pay homage to the elders, and the elders thank them by giving token money (like Rs. 10 or US 25 cents). Another thing many do is leave food out on banana leaves for birds to take. I don't remember having done this, but I do know many South Indian people will take the first bit of rice cooked in any given day and set it outside for the crows to take, so this is not necessarily a habit only for Pongal. Some also go to temple, as shown in the photo. The photo is taken from the top of the staircase we climbed to get in the temple. Additional pertinent information: As of April 2008 the government of Tamil Nadu has changed the date of Tamil New Year. It was well-known to fall on April 14 annually. 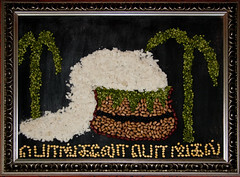 Now Tamil New Year will fall on the first day of Pongal, or the date being Thai 1 as calculated by the Tamil calendar. This means that Thai Pongal (First day of Pongal) and Tamil New Year will fall on the same day as of Thai 1 (2009) or about January 14, 2009. Read about Tamil New Year.